Marni Rice is a chanteuse, theater artist and accordionist whose repertoire embraces vintage French chansons, European art songs from the 1920s, 30s and 40s, and her own original music. Songs of an Immigrant: Tales from Paris is an autobiographical work based on her years in Paris and the so-called “Chansons Réalistes” of the 1930s associated with Piaf, Fréhel and Damia. 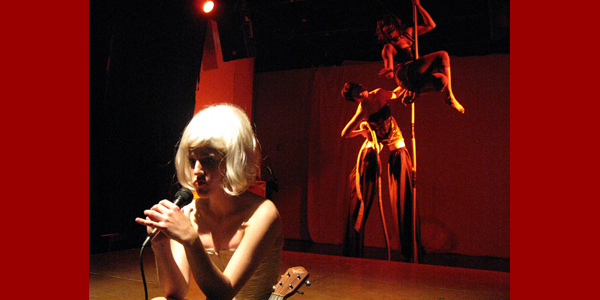 It is a merger of tragic songs, comic stories and her New York style of performance. She will be at the Tokyo and Kyoto Fringe Festivals in spring 2009. She will premiere a French language adaptation at the Festival D’Avignon in summer 2009. Anonymous Ensemble is a Brooklyn-based troupe of theatre artists, musicians, dancers and technicians. AnEn cultivates a rock show dynamic between performers and audience, using elements of rock and electronica, live video manipulation, web based media, dance, circus and drama. Focusing on the often violent over-sexualization of women in wartime, Troop Troupe is a satiric exploration of the dynamics of performance, military culture and gender and takes its form from USO shows. Katt Lissard is a writer, playwright, teacher and the artistic director of the Winter/Summer Institute. A one-woman show performed by six actors, Outpost is presented as an interrupted letter home from Lesotho in southern Africa, one of the planet’s remaining “unique and distant” places, with appearances by the U.S. Ambassador, the Unabomber and the Venus Hottentot. Mariana Carreño King is a freelance writer and playwright, actress, director and translator. Her play, Ofelia’s Lovers, takes place in Lisbon as Ofelia Queiroz courts the great 20th century Portuguese poet Fernando Pessoa in the shadow of his many celebrated sub-personalities.